The lucky bamboo plant is a very special type of plant also known by its botanical name 'dracaena'. This plant has special significance in feng shui, because it can be known as a symbol of vitality and strength. Its rapid growth without the need for a lot of care makes it an excellent indoor plant for nearly anyone. Lucky bamboo plants can thrive almost anywhere, which makes it the perfect addition for the home or business. You might notice that there happens to be a lot of different arrangements for a lucky bamboo. They come in several numbers of stalks, are often straight or curved and are sometimes formed into different shapes and sold as novelty items. The quantity of stalks itself has special meaning. The greater the amount of bamboo stalks in an arrangement does not necessarily translate to better luck. If there are 3 stalks or 6, it represents happiness. 5 or 7 stalks symbolizes health. 2 stalks represent love and marriage, 8 represent wealth and abundance, 9 stands for good fortune and a big arrangement of 21 stalks symbolizes blessings. Pair the correct number of bamboo stalks to the appropriate area of your room or the whole home using a bagua map. As a way to do this, you need to stand by the entrance placing the bagua out in front of you positioning the fame section facing the opposite wall and the career section directly in front of you. You can use it to map out the areas of a space that correlate towards the different areas of your life which includes wealth, career, love and health. 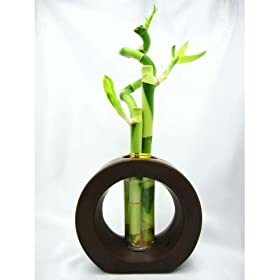 There are also special methods to use the lucky bamboo to exemplify the five elements of feng shui in action, creating balance and harmony in the specified area. The plant itself represents the wood element, simply place them in a glass vase filled up with water to incorporate the metal and water elements, add some stone for earth and tie the stalks together with a red ribbon or string to include the element of fire. Even though the lucky bamboo plant will not need considerable special attention or care, that doesn't mean that you may just neglect it. It still needs watering every now and then, do so every time the water reaches below one inch in the vase. You should not place them in direct sunlight, they function best in areas that are dimly lit. These plants are commonly used in feng shui as remedies to attract good 'qi' or energy and can be seen in several offices to bring good luck to a business. They can also be excellent gifts for any housewarming or a new business. Find out why the lucky bamboo plant is a great tool for feng shui home design. Use the map bagua to find the perfect spot for this and other good feng shui remedies.